In August of 2000, I was thinking of getting a sports car again. Since I was able to drive I had always been into fast cars. After looking into getting a Mitsubishi 3000 GT VR4, I decided that I could not afford one. Needless to say, my insurance company was not thrilled about it either. I had an 87 Fiero GT from 87 to 91 and decided to get one again. The 87 GT I had then was a summer project for me. I am a technology education teacher in a high school. I was looking for a project to spend the summer working on. I found a rebuildable wrecked 1987 GT in mid 1987 and the car only had 2000 miles on it and was still under factory waranty. It was sweet with all options including the rare suede tan leather seats and looked much like this one. I kept the car till 91 when my two daughters were too big to strap in side by side. In my search to find one again, I looked up information about Fieros on the Internet. I found out by luck the Fiero Dutch Classic show was going to be happening in two days and was only 10 miles from my house. Vonnie and I attended the show just to see them. I saw Jeff Dedays car, which was a mint 88 red GT t-top. It was the first t-top I had ever seen. I didn�t know they were even made. 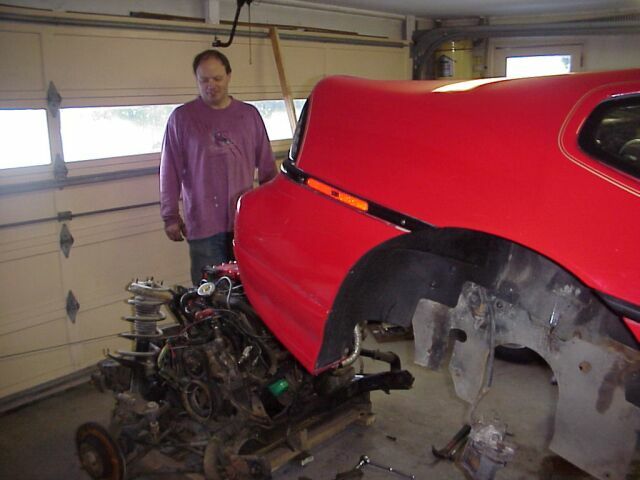 Here is a picture of Jeff with his low mileage sweet 88 GT. It had only 6000 miles on it at the time. I knew that was the model of car I wanted. Finding a good red 88 GT T-TOP is not an easy thing to do and it took months of looking. That day at the show Vonnie also decided she wanted an 88 GT. She found hers first, a sweet 88 GT she bought in September. 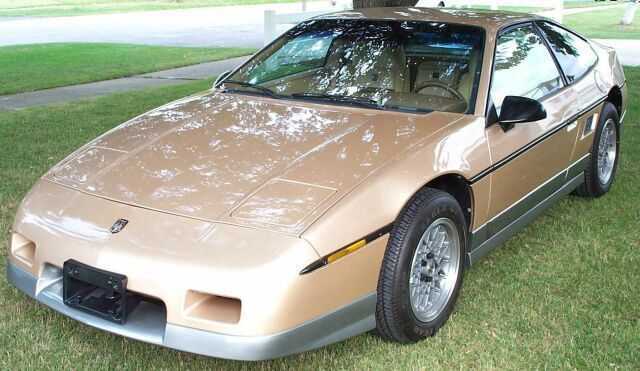 After looking at hundreds of Fiero photos I was determined to get a red 88 GT T-Top with the beechwood interior and gold wheels. 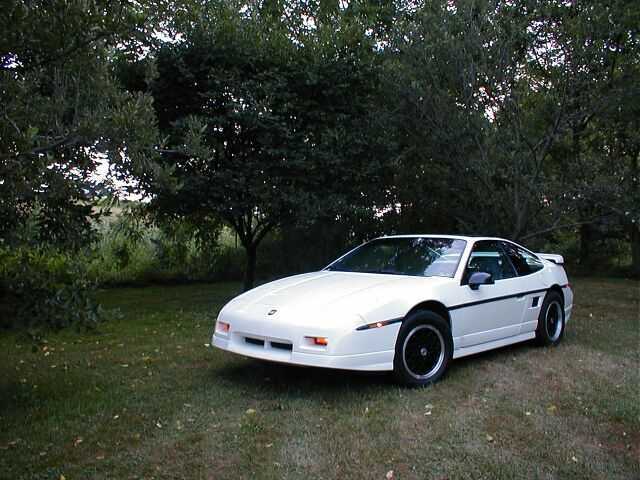 I found one listed for sale in the Michigan Fiero club website. I emailed the person and they sent several emails some with pictures including this one. I had a long phone conversation with someone that obviously knew a lot about Fieros. He told me that he was selling it for a woman in town that had the car for a long time. I was told it was in rough condition with only 66,000 miles on it. Well I know this picture does not look too bad but it needed a lot of work. The paint was fair but had been poorly repainted on the nose, left front fender and drivers door. The interior was very dirty and dingy from a heavy smoker. It was so heavily smoked in I had to disassemble the gauges to clean the white numbers because they were brown. The tires needed replaced, and the pin stripe had to go. 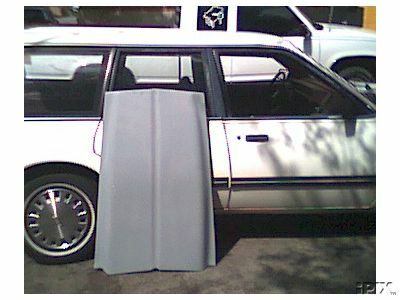 Rocker panels and quarter windows needed replaced. 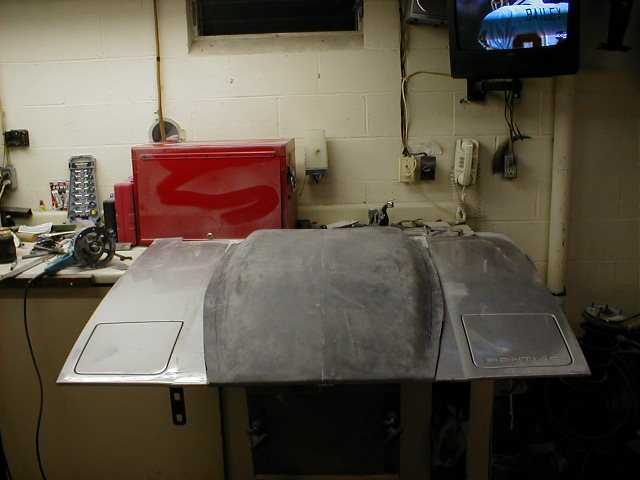 The T-top weather stripping needed replaced in addition to the driver�s door panel and front fender. The car had been driven daily in Indiana year round. I decided to get the car sight unseen for a fair price. I hopped a Greyhound bus for an all night trip from PA to Indiana. After a grueling 10-hour bus ride, a great guy, Chris Moore, met me at the bus depot in Fort Wayne, Indiana. 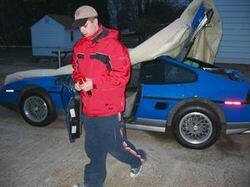 At this point in my Fiero life I had not shown a car, and was unaware who Chris was. Well you could imagine my reaction when we went inside the garage seen in the above photo. 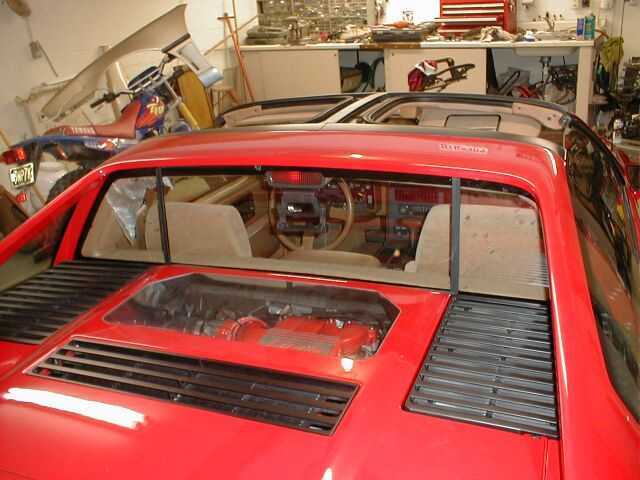 Inside were three, yes three, red 88 GT t-tops. 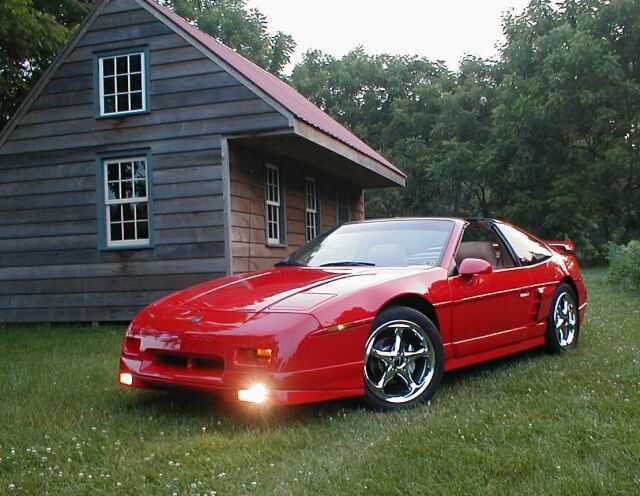 Chris also had his Northstar convertible but he made me promise not to mention it since he wanted to surprise the Fiero world with it that spring. 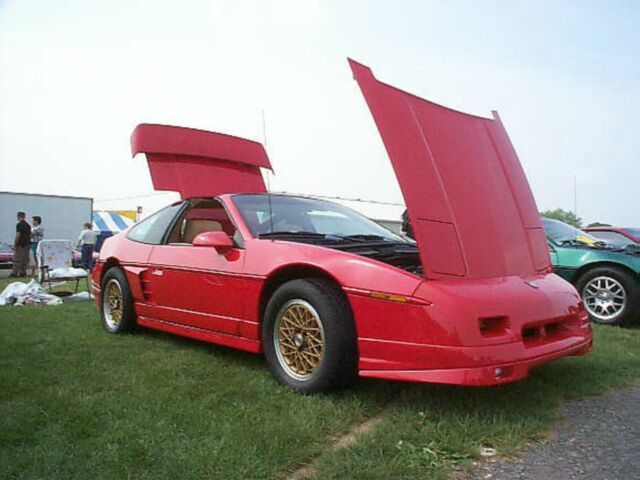 Also he had his other awesome Northstar Fiero as well as his brother�s cool Fiero in the garage. Unfortunately the car I was buying was the worst one in the garage but I was inspired to change that. After taking care of the title, I started driving it home. After 50 miles I needed to stop for gas and when I drove away I noticed the automatic trans slipped. Later while stopping for a turnpike toll both I noticed it slipped a lot. I stopped and checked the trans fluid and none registered on the dipstick. Yikes! I filled it up and had to stop every 1/2 tank and refill it. Now I was doing this during my Christmas vacation so wouldn't you know it, Great Lakes effect snows started blowing real hard. The Fiero was all over the road and I was only able to follow a tractor-trailer tire tracks because the snow was getting a few inches deep. Well after about 12 hours of driving I got home and the car was totally white from road salt. It had a front manifold leak so I tried to fix it and of course the bolt broke so the second day it was home the engine/trans/cradle were on the floor. I figured it was a perfect time to detail the engine compartment, engine, cradle and suspension. I spent two evenings sitting inside the engine compartment cleaning everything. Vonnie worked hard on detailing the suspension and cradle for me. The leaking automatic transmission leak was also repaired with a new pan gasket. After getting the engine back in I started working on the bad paint. I talked to some body shop guys I decided to do a panels off paint job. I bought a new GT nose and rocker panels and had a puncture on the rear bumper professionally repaired. Here is what it looked like when I drove it to the body shop. I learned he made it out of an old GT nose. So I made one too except I added driving light pockets by bonding rear reflector pockets off an old GT rear bumper. I also had found a set of rare urethane Mecham side scoops. The Mecham racing team was authorized by Pontiac to use the actually Pontiac molds to make these scoops so they fit perfectly and are unbreakable. Here is the car after painting it. 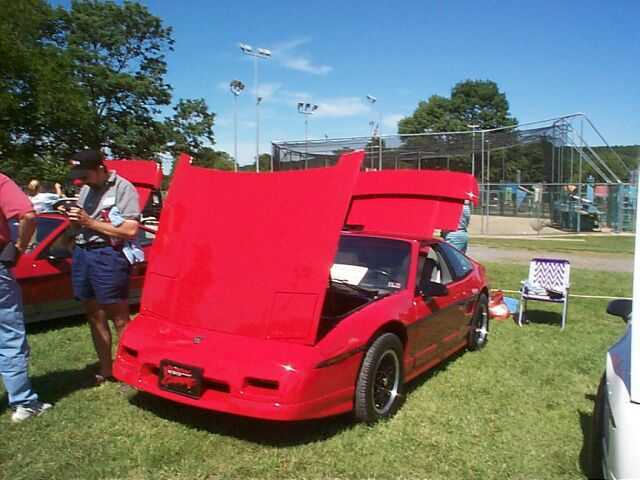 I took it to spring Fiero show in Carlisle like this in 2000 and was in the tough custom class. It did not receive any awards but did have a lot of people checking it out. Later that first summer I had a crazy idea for the trunk. On the bus ride to Indiana to pick up the car, I bought a car magazine that had a picture of a Ferrari Spyder 360. The Spyder had an engine window and vents over the mid engine. 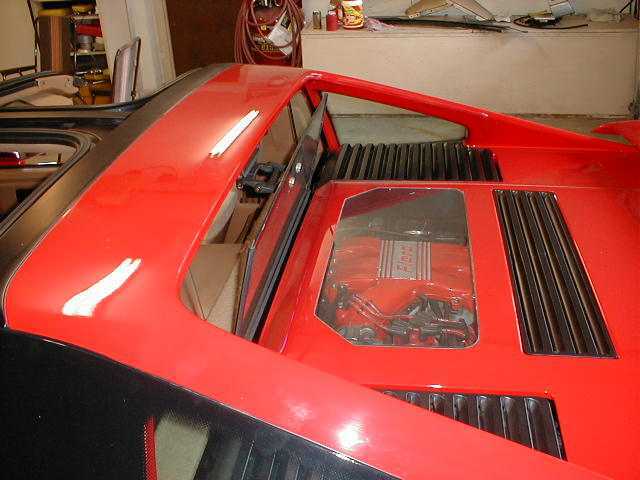 I decided that the Fiero had a cool looking engine too and I should try to show it off. I decided to create an engine-viewing window. Fleabit had a scrap trunklid for me to practice on. While working on this I decided to cut the next recessed area out on the underside to see if that would work for a vent. After going through two sets of grills and a whole lot of work on modifying a set of Fiero grills I got something that satisfied me. This trunk lid was also given to me by Fleabit. 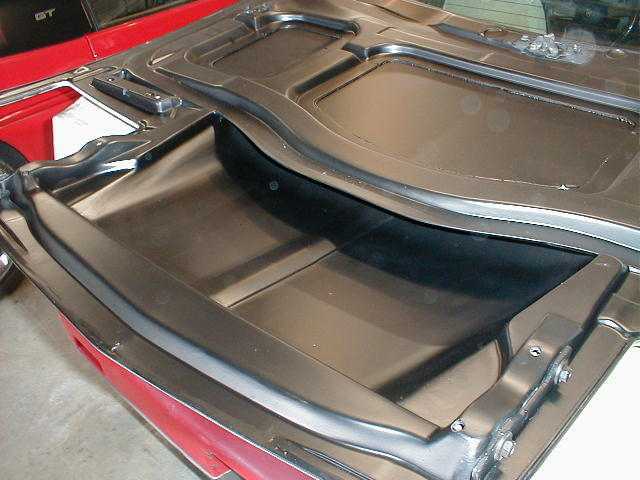 I then returned to my painter to get the new modified trunk lid painted. Here it is with the new trunk lid. I have all the original body parts so I could restore to car back to stock. All the extra original body parts were also painted to match the new paint job. That was a lot of extra expense. I have finally come to the conclusion that I will never do that. 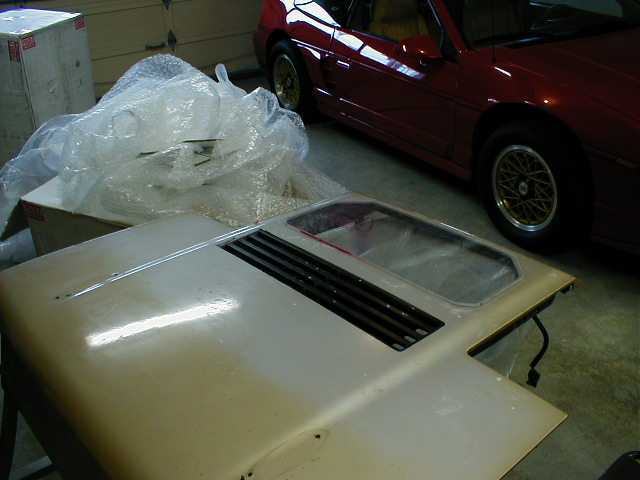 So now my family room has nearly an entire set of nicely painted Fiero quarter panels, hood, trunk and front fenders. 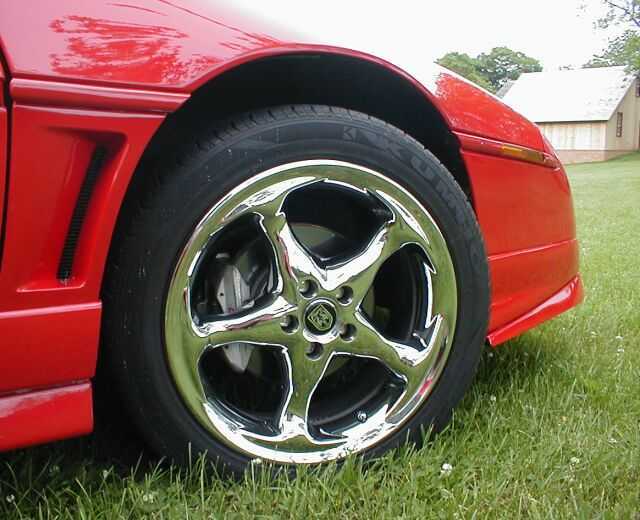 After I had gone to a few Fiero shows and showed my car in the custom class I realized that I did not have a chance with my stock wheels in a custom Fiero class. I looked and looked for a set of wheels. I wanted something to give an appearance of being strong. I disliked the appearance of wheels with thin spokes. The car being monochrome really needed something to create some "pizazz" so I decided to go with chrome wheels. I found a set I liked through a shop that sold discontinued and clearance wheels. I think they were a good choice. They are 17" Prime wheels model 705. After I had them on I took it out for the first time to take pictures of my car. At my brothers place I took the now familiar photo of this car. If you compare this photo with the ones prior to the new wheels, I think you will find a dramatic change in the appearance of the car. In other words the wheels can really make the car. The very next day this was my car. This was as far as I got during the first show season with the car. Wow great story so far ski. I can't wait to hear the rest. With the accurate understanding of god and his law they went about the work of building a new nation....The Rainbow Children. Well after seeing your workbench I don't feel as bad since mine usually looks about the same way (cluttered). Very very nice, well this gives me hope on my fiero =). Rate me if I've helped or just if you liked my responce. 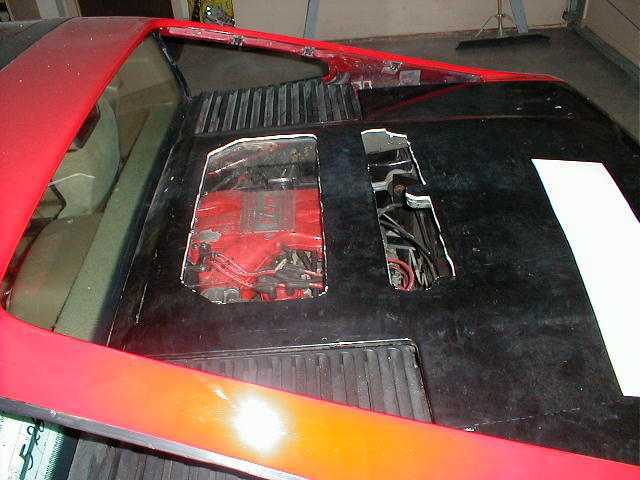 I had no idea your rear window was removable sweet idea, I would have gone for the whole window though, any reason you didnt or couldnt do this? The whole window will not clear the rounded corners of the rear clip. Also the window does provide some body strength so leaving the smaller pieces glued in give strength to the body. wow I didnt know that you just got into Fieros in 2000. You seem like quite an expert. 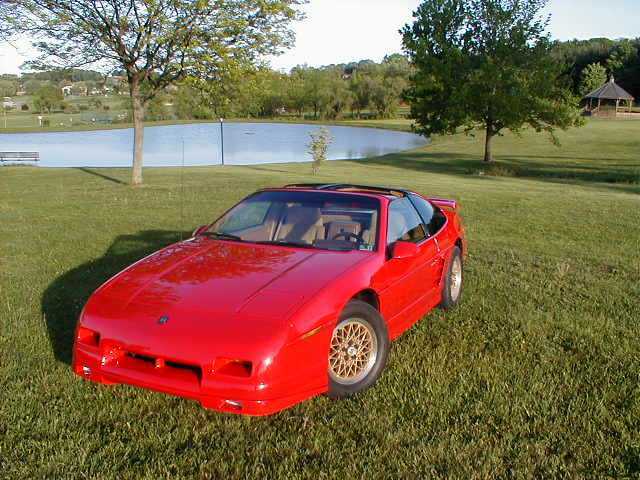 Well I gotta say, your Fiero is one of my favorites on the forum. Keep up the great work! '88 GT-Celica, not Fiero...FOR SALE! long journey.... LOL wow ski u always seem to amaze me . Great story, Ski...I'm looking forward to the next installment! Your car is truly amazing...I hope to be able to see it in person one day! Have fun skiing tomorrow...and watch that knee! We'll be waiting for your next post when you return. Really shows how much love and hard work went into this car. Simply beautiful! Well the wiring harness goes through the center, but I guess that could be moved. All in all it would be a huge project since there isn't that incredibly much space for movement. Well, I did not exactly just get into Fieros in 2000. I had Triumph sports car since I was 15. I work as a sports car mechanic to pay my way through college. So I knew my way around cars. (Except computer controlled modern cars since they were not controlled that way back then). After getting married I was without a sports car for the first time in my life. I teach technology education in a high scool so one summer in 1987 I was looking for a project to work on during my summer vacation. I found a rebuildable wrecked 1987 Fiero GT. The car was brand new with all options including leather seats. It was hit on the passenger side from door on back. The car only had 2000 miles on it and still smelled new as well as having the factory warranty on it. I drove that car from 87 to 91 when my two daughters got too big to strap them in the passenger seat side by side. It was a sweet car but as you can see I was not totally new to Fieros when I purchased the red GT t-top. I of course studied lowering it but quickly decided it was not feasible. 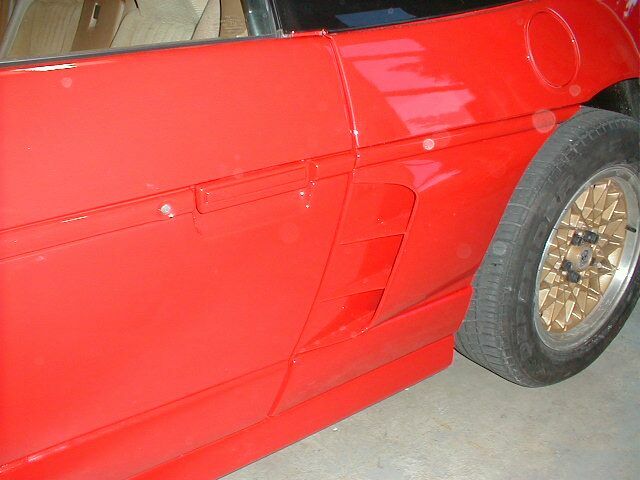 If you go out and look at your Fiero you will see that if you follow the window surface straight down you will be into the manifolds of the engine of a V6. The original rear window is tempered glass. You cannot cut tempered glass so you have to make new glass. You choices are Lexan, inexpensive safety glass or expensive custom tempered glass. I tried safety glass for all three pieces but the center one cracked as soon as I closed the latch. I then got a custom piece of tempered glass made for the center piece. Thank You very much for running with this idea from "the ugly/sad Fiero" thread. It really makes me more appreciate the effort you put in your car. I like the way you tied your purchase to seeing the red GT in the Dutch classic. It's a nice way to start your history. Good stuff, thanks for the reply in the other thread! REMEMBER: stoplights synch'd for 35mph are also synch'd for 70mph. I've been waiting for something like this. Keep the history commin!...I'd make one of mine, however, I don't have any pics of the 2M4 before it was turned into a Cadero or anything. Awesome work Skitime! But it was the leather seats that really put the car over the top. Through all this I am sure you have learn't one valuable lesson. Buy stronger vises. 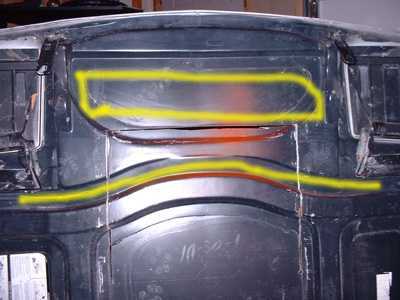 Ski your decklid has inspired me to either make one similar or go the vented route with little covers for when it rains. muhahaha! I forgot all about that Aus! ...so the second day it was home the engine/trans/cradle were on the floor. 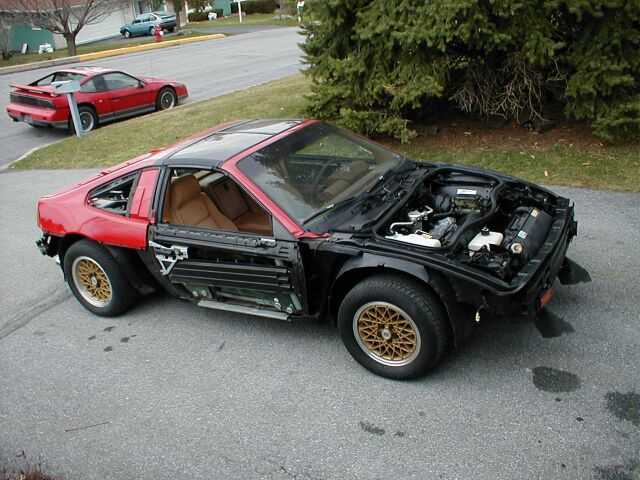 Two days into Fiero ownership and you drop an Engine/cradle!! You are amazing Skitime!!!! I ended the first installment of the history of my car at the end of the first show season. I ended up doing fairly well at the shows as my first show season progressed and the car evolved. 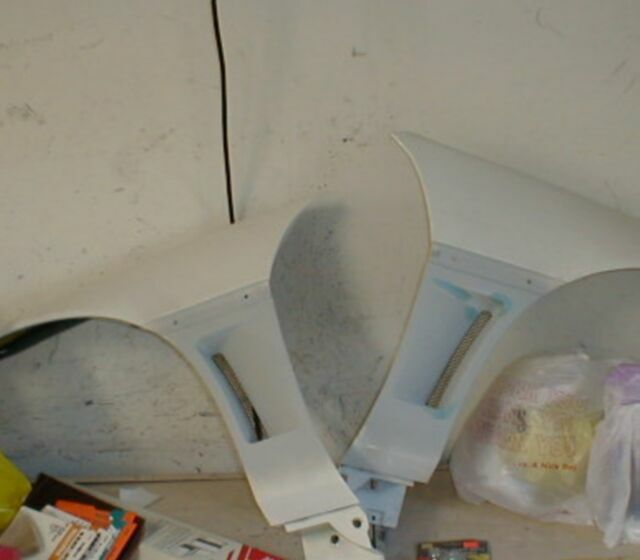 After the last show and the PA Fiero gathering in the fall I started in earnest to finish a fender modification that I had started earlier that summer. While I was at a junkyard that summer, looking for hardware to build my removable rear window, I noticed a 80s Trans Am with non-functional front fender vents behind the front wheel. 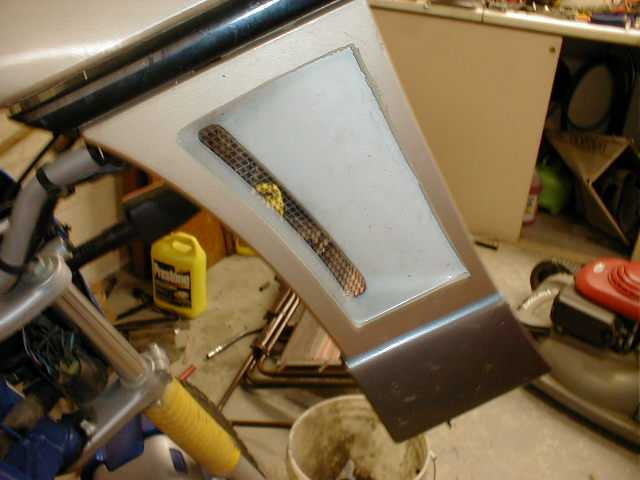 The vents are made of urethane that was mounted in a recessed steel fender. After looking at them I thought to myself �hmmm I think I have a home for these�. I got a scrap fender and tried it out to check if the contours would fit. It was almost perfect. Since the piece is also urethane I used urethane panel repair epoxy to bond the two pieces. My intention was to make the fenders functional. I was going to vent the air pressure behind the radiator to these vents with ducts and cutting through the fender wall beside the headlights. But as fate would have it another project came up that changed those plans so I have not made the vents functional yet. I really don�t like that since I sort of dislike non-functional vents. I may still make them functional. Here is a close-up after being painted. 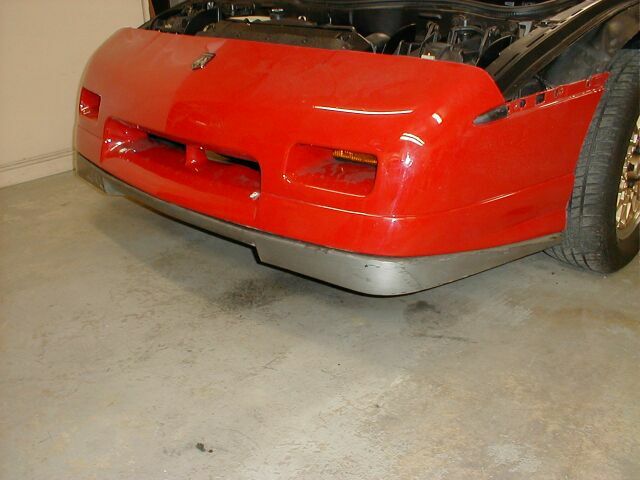 I found a ZR-2 hood for sale in the Pennock�s Mall. I thought that I might be a great way to vent the pressure behind the radiator. After I received it I was very disappointed in the quality of the piece. 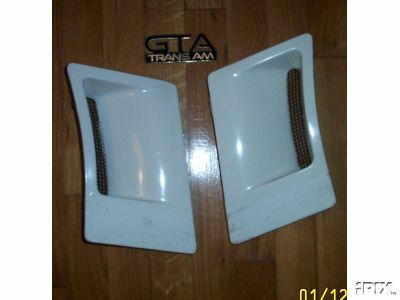 I do not have a picture of the scoop when I first got it but it looks like this Ebay pic. I had bought it second hand so I do not know who originally made it. I set it on the hood of an 86 GT I had bought to see how it changed the appearance of the car. I left it on there for a few weeks and every time I looked out the window at it there was something I did not like about it. Now I want to be careful here not to offend anyone so this is my personal opinion about the scoop and I am not trying to put down any one else�s car. 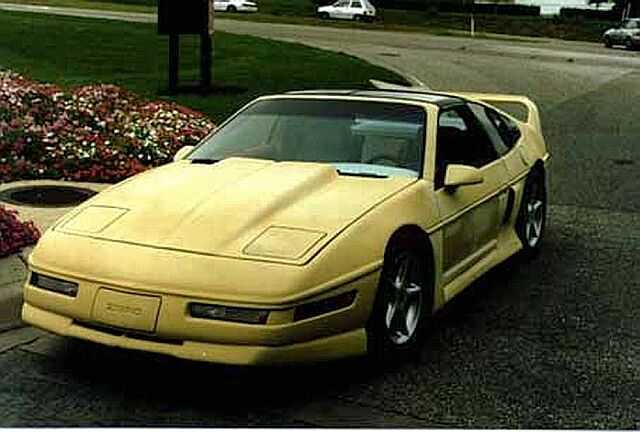 I finally realized why I did not like it was because it did not work with the original bodylines of the Fiero. 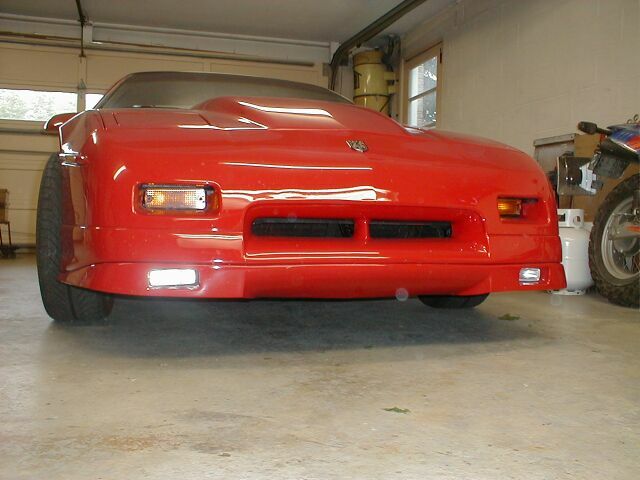 If you look closely at a Fiero hood there are three lines, which are all, carried down onto the nose. The scoop covered the two strong lines running past the headlight covers. Even worse it created a change of the raised centerline coming from the nose into a wide dip. Now these scoop lines look great if you use the whole ZR2 body kit but in my opinion not with just adding the scoop to a Fiero. 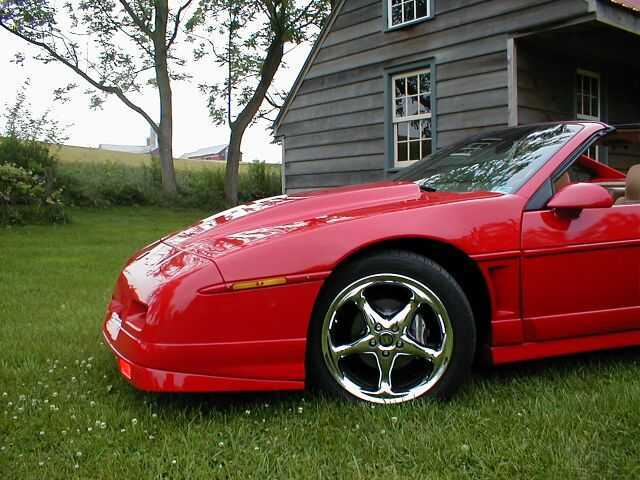 Here is a ZR2 Fiero example and it does look good since there are no body lines coming off the hood. 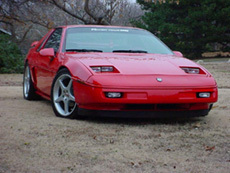 So I was going to sell the scoop but decided I could at least see if I could modify it to work with the Fiero. I told Vonnie I was going to cut a $100 bill in half with a circular saw. I took the scoop in the garage and cut the center 4 inches out of the scoop. Now my scoop was laying there in three pieces. Wish I had pictures of that. I used my front porch as a huge sanding block to get the two large halves straight enough to bond them back together. I used the 4-inch center strip to reinforce the bond of the two halves by bonding it underneath. This created a scoop without the center dip and made the scoop narrower so I would not loose the sharp lines found on the hood. I got an extra hood from Foxgapfiero and proceeded to bond the hood and scoop together. Let me discuss the opening in the hood and hope not to offend anyone. 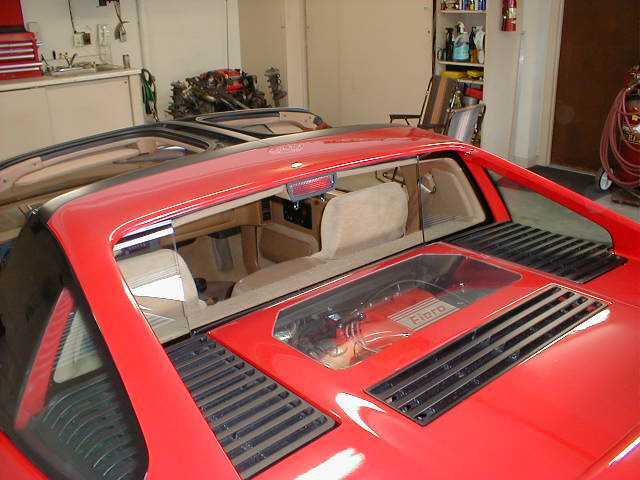 I see lots of Fiero hoods with the vent being the half moon shape on the underside. Here is the only pic of have of the underside. 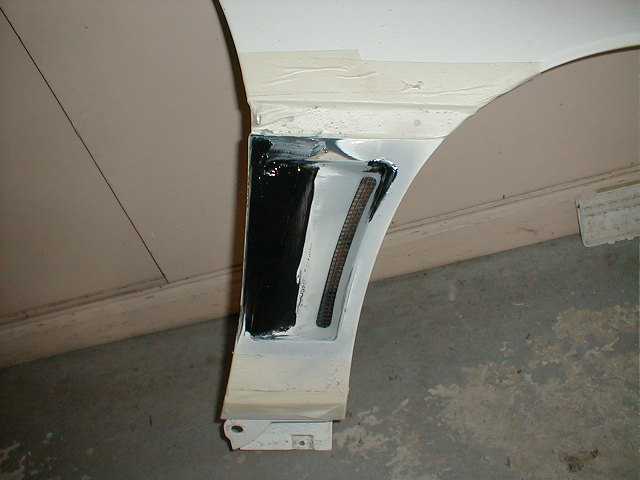 I know why they use this but if you go out and look at your Fiero nearly all this shape is over the radiator and not behind the radiator. Obviously you want the opening to be in the air stream coming out of the radiator. I attemted to maximize the opening and work with the air flow which is actually upward out of the radiator. I followed the curve of the trunk wall as close as possible and create a shape that would assist extracting air. 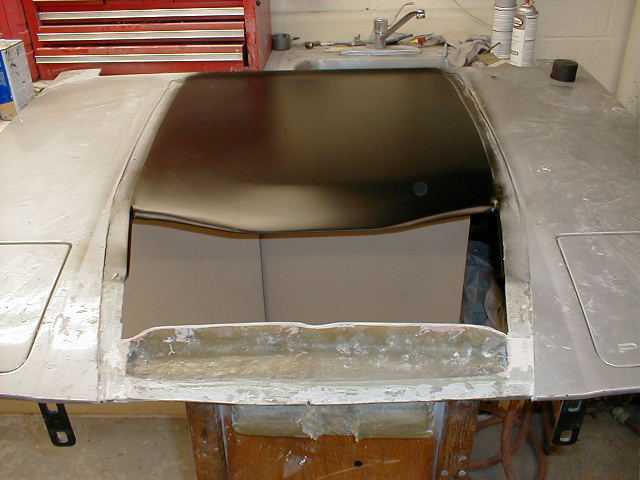 I also wanted to retain the body lines on the top of the hood so I did not bond the scoop to the top surface but recessed the bonding surface the retain the close by body lines. 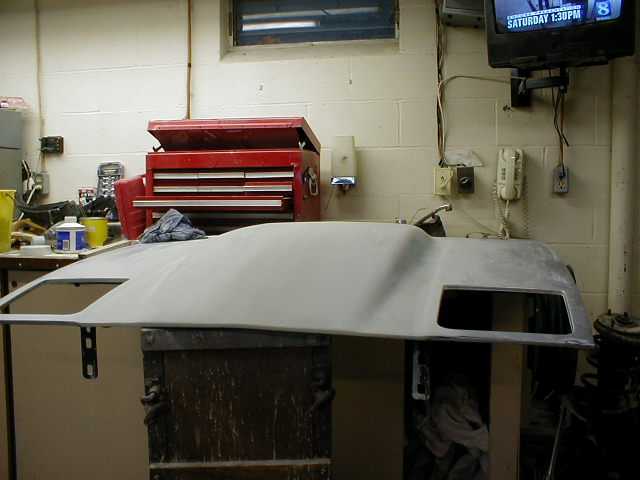 Here is the hood prior to bonding. I spent an unbelievable amount of time doing the bodywork to get the hood looking correctly. I prefer to do my sanding and contouring by hand so it took a long time. The underside of the scoop was ugly sprayed fiberglass. I hate to see scoops that are added on that look great until you see the underside. 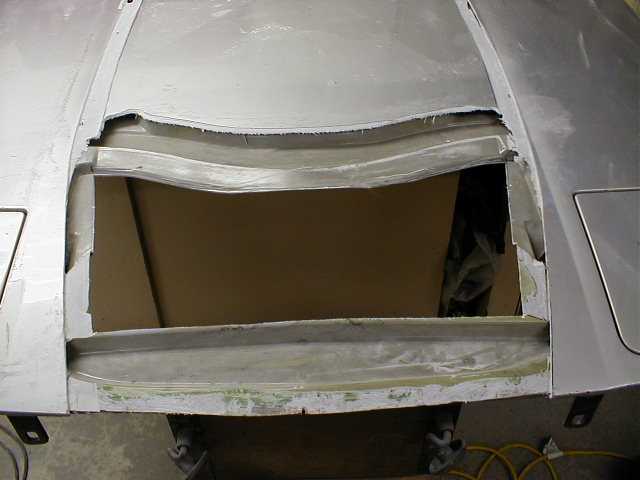 Often you will see rough fiberglass or the hacked up openings where a hole was cut and not blended into the scoop at all. I spent weeks working only on the bottom to blend all surfaces to make it look like it was not added on. So in the end I ended up with what I felt was an extraction hood scoop that worked with the bodylines. Here is my car after another trip to the paint shop.